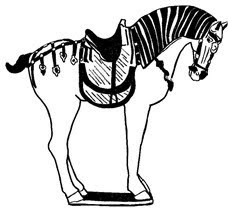 Courtesy, in part, of Gene Freeze, President, County Saddlery, Inc.
County Saddlery can have the trees in our saddles adjusted by putting them in a vice-like device, however, we strongly recommend against it. The concerns raised by consumers about how to maintain fit when horses change is largely addressed by the fact that County designs allow for substantial adjustment within the panels themselves. They are further addressed by our tree change policy, whereby County will replace the tree within twelve months of purchase if the horse changes enough to warrant a different size tree. The cost is a pittance compared to the performance, soundness and value of the horse. So what happens when a tree is “adjusted” from the original design? It is difficult if not impossible to simply squeeze or open tree points EVENLY using the devices typically used. It is no wonder, therefore, that trees that have been so altered rock on the horse’s back and create uneven pressure at the points. Different tree sizes have different shapes. So it is impossible to make a pommel designed for a narrow horse spread to the shape of a wide horse by simply pressing it open or closing it . What happens to the REST OF THE SADDLE when you stretch or close the front of a tree? ...The tree is made to very precise specifications in terms of shape and balance and calibration. ...It is reinforced with steel over the top and underside of the pommel as well as down its length to a precise tension. ...The tree is then strained up with nylon webbing from front to back and side to side to a precise tension and shape. ...The seating material is then placed on the webbing. ...The tree shape is altered and no longer calibrated ...The tension in the steel reinforcement is altered ...The strain on the webbing becomes looser or tighter ...The seat itself is now sitting on a platform compromised by all of the above.